Chicago band trips are one of Music Travel Consultants specialties. The Ohio State School for the Blind Marching Band’s performances in the Windy City were simply spectacular! We couldn’t wait to share this band’s trip. 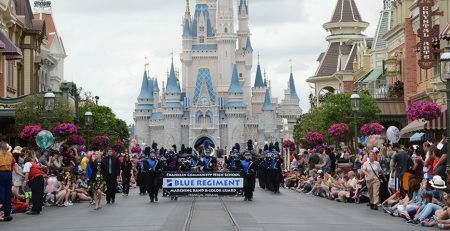 The OSSB Marching Band is the only blind marching band in the world, and its members come from all over the state of Ohio. 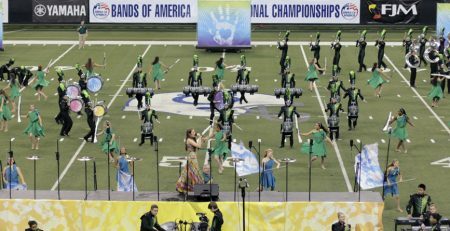 Internationally recognized, the band under is the leadership of Director Yolanda Johnson, Drill Writer Jeff Schneider, and founder Carol Agler. OSSBMB recently represented the state of Ohio in the National Memorial Day parade in Washington, D.C. On September 21, 2013. They joined The Ohio State University Marching Band in a “Double Ohio” drill during halftime. OSUMB performed Script Ohio, while OSSBMB performed its signature drill, in which it spells out “Ohio” in Braille. OSSBMB received the prestigious “Creative Use of Braille” award from the American Printing House for the Blind (AMP) in October 2013, for its use of Braille in its drill. 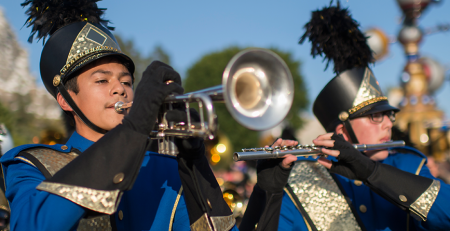 And, in 2010, the band marched in the Jan. 1 Tournament of Roses Parade. For opening the eyes of its community by creating new standards of excellence for persons with disabilities, Phi Mu Alpha Sinfonia Fraternity awarded OSSBMB its prestigious National Citation. Great view of the Ohio State School for the Blind Marching Band in the Lions International Parade performing for the crowd. The OSSB Marching Band left their school with their MTC Tour Director early on a Friday morning, on a motor coach headed for Chicago. After a quick en-route lunch, the band arrived in the city of superlatives—world class museums, America’s second tallest building, mouth-watering cuisine, dazzling shops, the Magnificent Mile, and one of the most dramatic skylines in the nation! First up was the Museum of Science & Industry, the world’s most popular museum, in which the band experienced games and the Apollo 8 Space Ship. They also visited the Coal Mine Special Exhibit. After the museum, the band enjoyed a dinner at the Hard Rock Cafe, a popular eatery featuring great rock memorabilia, music, and food in a high-energy setting. Then, it was off to the Magnificent Mile. It doesn’t get any better than the Windy City’s North Michigan Avenue when it comes to shopping. From Water Tower Place to Bloomingdale’s, Neiman Marcus, Crate & Barrel, H&M and Filene’s Basement, the choices are many. If it has a brand name or a logo, you can find it here! After the shopping extravaganza, the band called it a day and loaded the coach for the DoubleTree Hotel. At an early get up and go time of 5:oo a.m. the next day, the band grabbed breakfast at the hotel, dressed in parade attire, and brought their instruments for the performance in the Lions International Parade! The official Ohio State School for the Blind Marching Band drum head. Lions Clubs International was celebrating its 100th Anniversary! Founded in 1917, charged to improve its member’s communities, Lions Clubs have made its mission world-wide to aid the blind and visually impaired. 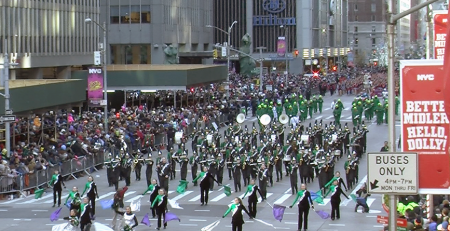 As a special anniversary event, Lions International planned a gala parade through downtown Chicago, and the Ohio State School for the Blind Marching Band would perform in the gala parade in downtown Chicago, as the only band selected to represent the State of Ohio. The parade route (approx. 1 mile long) began at the intersection of Lake and State streets, then proceeded down State Street, past the judge’s stand, and ended at State Street’s intersection with Van Buren Street. Parade viewers lined the parade route along State between Lake and Van Buren streets. The Ohio State School for the Blind Marching Band making memories. “As much as I admired the kids, it was just as humbling to meet the adult volunteers who are assigned to each student when they march. These aren’t typically parents of the students, they are volunteers who have connected with the program somewhere along the way. One couple has been doing it for a decade or more. After an incredible performance, the band prepped for Lincoln Park Zoo. Established in 1868, this is among the oldest zoological gardens in the country and is also among the most modern. A premier Chicago attraction, Lincoln Park Zoo each year welcomes more than three million visitors, providing them with remarkable learning experiences as well as fun and enjoyment. The band had lunch at the zoo and spent the afternoon enjoying more of the zoo. Then they met in Millennium Park for a group photo. Next, it was off for a great dinner at the Rainforest Cafe where the band relished in a WILD meal under a jungle canopy. The rumble of tropical thunderstorms, animated wildlife, and a spectacular fiber-optic starscape make for a unique dining experience. After the Rainforest, the group returned to the Return to the hotel for some free time at the pool and then it was lights out because the band has to be ready for another performance the following day! After a 6:00 a.m. wake-up call and breakfast at the hotel, the band prepared for their performance at the Field Museum. The Field Museum is one of the world’s four greatest natural history museums, alive with knowledge and discovery. Founded in 1893, the museum houses over 19 million artifacts and specimens drawn from the fields of anthropology, botany, geology, and zoology. Before the band performed, they enjoyed a special exhibition of the Cyrus Tang Hall of China. And then, the band performed in the amazing Field Museum grand lobby. Historic Stanley Field Hall is not your typical performance venue. 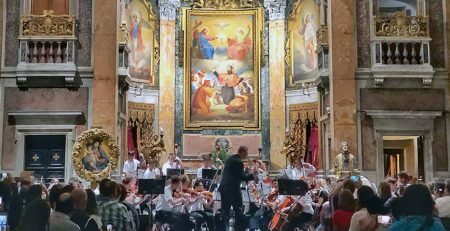 With two African elephants and the largest T.Rex skeleton ever found, the performance space is the size of a football field with a 70′ marble ceiling. The acoustics are amazing! Ohio State School for the Blind Marching Band performing at the Field Museum. After the performance, the band stored all equipment on their bus and returned to the museum for a guided tour. The group experienced the tour with touchable objects. Following lunch, the group was then off to the wondrous Shedd Aquarium. 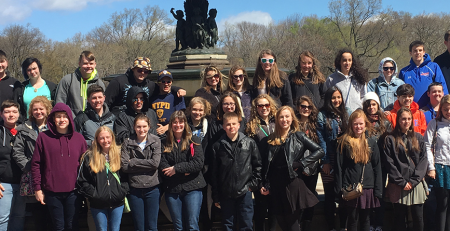 The band enjoyed an Aquatic Show, Wild Reef Exhibit, and a special exhibit. The group learned how animals like beluga whales, sea lions, and dolphins at Shedd are cared for every day by their trainers. Then the group got to witness how the Shedd way of training highlights their incredible natural behaviors. Then, it was off to feast at Giordano’s Pizza, famous for stuffed pizza, mouth-watering pasta, and some of the most authentic Italian cooking this side of Torino! The band then arrived at Cadillac Palace Theatre for a spectacular Broadway Show! The beloved story of Aladdin was brought to life in this bold new musical. It’s an unforgettable experience that includes all the cherished songs from the Academy Award-winning score and more written especially for Broadway! 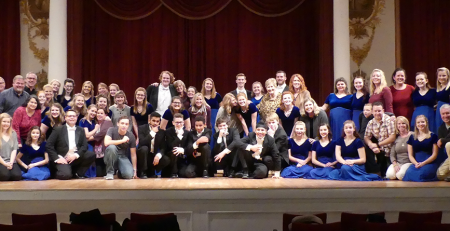 After the musical, it was back to the hotel for a well-deserved night’s rest. The next day, the group had breakfast at the hotel, hopped on the coach, and enjoyed free time and lunch at Navy Pier. The Pier, a Chicago landmark since 1916, is a 50-acre world-class recreation center that was reopened in 1995. Its beautiful lakeside setting is a sight in itself! Restaurants, shops, a musical carousel, a giant Ferris wheel, an IMAX Theatre and a variety of entertainment make Navy Pier a fun place to be! The Ohio State School for the Blind Marching Band arrived home late that same evening, ending an excellent performance trip to Chicago. Ohio State School for the Blind Marching Band group photo. 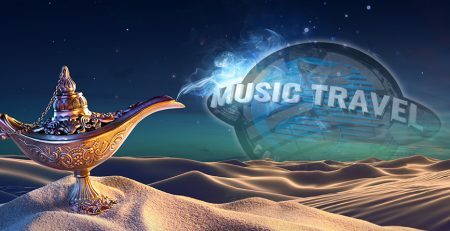 Contact Music Travel Consultants to start planning your trip! A longtime Ohio school music teacher and 2002 Teacher of the Year, Jeff Buchanan is an alumnus of Medina High School (Ohio) and Bowling Green State University. He served on the OMEA State Board as District II President and Technology Rep, and he's a past-president of the BGSU Alumni Band Board of Directors. Jeff's bands received numerous superior ratings at OMEA adjudicated events, and he is a former director of the Heidelberg College Brass Band and former interim director for Fostoria Community Band. His little-known claim to fame was a first-place trophy his Stryker HS (Ohio) All-Brass Band earned in a small town Indiana parade in the early 1980’s, outplacing the current BOA champion band. Jeff has been a featured Euphonium soloist with the North Coast Concert Band, Heidelberg Brass Band and Fostoria Community Band. He was pleased to conduct the BGSU Alma Mater with the Alumni Band for the Centennial pregame show in 2010. He is an active participant in community theatre throughout northwest Ohio with his wife, Laura, most recently performing in “The Full Monty” at Toledo Valentine Theatre. Having been a Drum Corps enthusiast for many years, Jeff found his way to Illinois State University in the mid-1990's for the BOA Summer Symposium, and the seeds were planted for a post-teaching career in the music industry. Jeff served as a regional sales rep with Music Technology firms Lentine's Education Technology and SoundTree before bringing his diverse background to MTC in 2009. 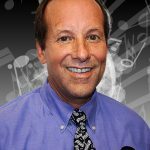 He has participated in countless trips as a music educator and Travel Consultant. Sons Adam and Tyler march with Jeff each Fall as members of the BGSU Alumni Marching Band.